A remarkable thing happened here on December 27th. We don’t normally get rain this time of year, but on that day we did. And just as the Sun was setting, an intense rainbow appeared. Conditions were excellent, with a dark sky background that enhanced the contrast. The colors in the bow were especially vivid, as the photo clearly shows. The fact that we had a rainbow wasn’t all that remarkable, but its location was. This rainbow appeared about as far to the north as I’ve ever seen. Note the compass directions on the graphic. Most rainbows appear (more or less) in the eastern or western part of the sky. That’s because rainbows always form around the antisolar point, so most are seen near sunset or sunrise. You need both rain and direct sunlight to form a rainbow, and oftentimes when it’s raining locally, the rising or setting Sun can peek under the cloud bank and illuminate the falling raindrops. Allow me to elaborate. 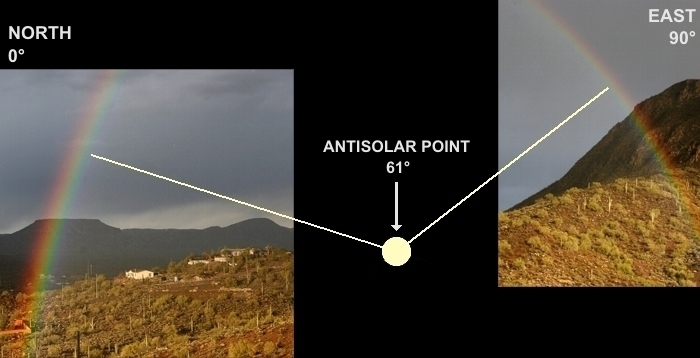 The antisolar point is the point in the sky exactly opposite the Sun. When a rainbow forms, light from the Sun is bent around inside rain drops and sent back to the observer (or camera) creating a circular bow with a radius of 42° around the antisolar point. In the graphic above, those white lines from the antisolar point to the bow are 42° long. If you want to see the physics of why this happens, go here. Because of this 42° geometry, if you’re observing from ground level, and the Sun is higher than 42° elevation in the sky, the antisolar point will be below the horizon. So less than half (180°) of the bow will be visible. If the Sun is higher than 84° elevation, the entire bow will be below the horizon. But there’s normally so few raindrops between you and the ground that not enough light is sent back to your eyes to make the bow stand out against ground clutter. This is why (unless you live near the poles) you’ll never see a rainbow at noon, when the Sun is highest in the sky. It’s also why you rarely see more than half the rainbow, instead of the complete circle. Under certain conditions, when you observe from a high altitude, say from an aircraft or mountaintop, there can be enough raindrops below you to return sufficient light and make the full 360° rainbow circle visible. Check out this amazing photo taken by a skydiver. The graphic is a composite of two photos showing (approximately) what I saw. I didn’t have time to get a fisheye lens on my camera, so I couldn’t fit the entire bow into one view as I did with this double rainbow. My first impression when I saw the December 27th rainbow was “Wow, that bow is really far to the north.” Then it dawned on me that we were still within a week of the Winter Solstice, and it all made perfect sense.